If you’re using a newer version of Windows, you’ll want to check out File History. It’s pretty easy to use, and it backs up your files incrementally, so it avoids huge repeated data writes that shorten the life of SSDs. That also means that using a mechnical hard drive isn’t so slow after all. What about data retention with SSDs? A few years ago, there was a huge panic. In short, a document about SSD life was misinterpreted by pretty much everyone. Reports spread that a disconnected SSD could lose data in as little as 7 days! It turns out that SSDs that are near the end of their useful lives (in terms of total data written to the drive) just happen to lose data when exposed to high temperatures. And then they might lose data much, much more quickly than normal. I never actually read the document itself at the time, and so I ended up misinformed like everyone else! 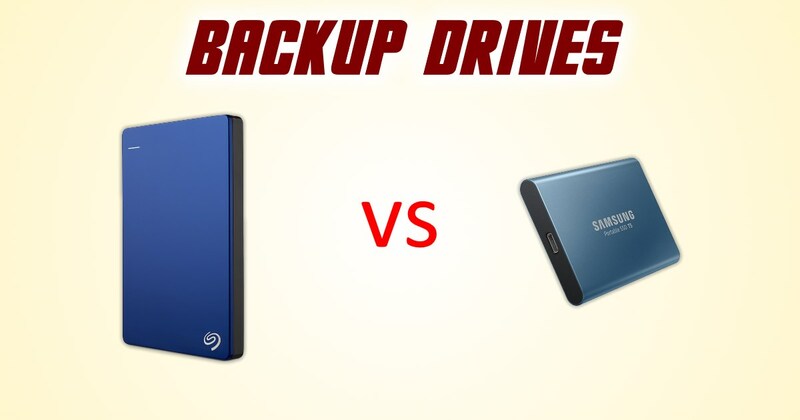 Well, oops… But what about mainstream newer SSDs that are just used as a backup drive? Unless you’re consistently writing terabytes of data to your SSD, your data should be pretty safe. You can even safely disconnect the external SSD from your puter and leave it sitting on a shelf for YEARS. You can buy a 2.5″ external 2TB normal hard drive with a USB 3.0 interface for about $77 at the moment. The newest popular external SSD, the Samsung T5, is currently $169 for 500GB, $349.99 for 1 TB, and a whopping $738 for 2 TB! Since File History backs up data a bit at a time – on the fly – the initial backup run will be pretty slow. But after that, the slower speed of the drive doesn’t matter so much. And the price is right! On the other hand, the Samsung T5 is pretty nice since it’s about half the size of a normal 2.5″ external HDD, and it’s also smokin fast: 540 MB/s read and write speeds. That’s 5-10 times faster than the standard external HDD – depending on what you’re copying to the drive. If your puter has an SSD as its main drive, backing up from SSD to SSD will take no time at all. But the SSD is gonna cost ya! 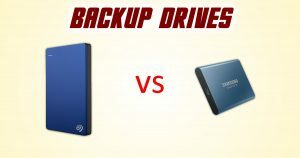 So, do you need an extremely portable external drive for shuffling files around or for backing up files from a laptop? Then make sure your puter has a USB 3.1 port (to get those max transfer rates) and grab a smaller Samsung T5. I think I’m going to stick with my 2TB Seagate for now. But it is good to know that when left disconnected from the puter, SSDs these days will store data for a LOOOONG time.